Eulenspygel - "Staub auf Deinem Haar"
Eulenspygel came from the Swabian area in the south-west of Germany. This album is a live recording that originally came out in 1973 and the lineup is Mulo Maulbetsch vocals and guitar, Detlev Nottrodt guitar and keys, Nic Nicoll sax and clarinet, Matthias Thurow bass and Gunter Klinger drums............DER FREMDE a nice Renaissance Faire intro! Moody prog rock sung in German, not bad! The spoken word section is very nice and then back to the jazzy rockout....This hits closest to a classic "Krautrock" sound than most of the Garden of Delights re-issues I've reviewed so far. STAUB AUF DEINEM HAAR nice uptempo rock, very Soft Machine'esque...some early 70's macho rock vocals! Oh Yeah! Some nice exploratory raga rock with clarinet. This is a pretty badass track, this is the kind of stuff that made them famous!? MENSCHENMACHER uptempo pop rock with a "groovy" lead vocal that sounds pretty outdated, whereas the long improv pieces sound very modern, cutting edge etc! 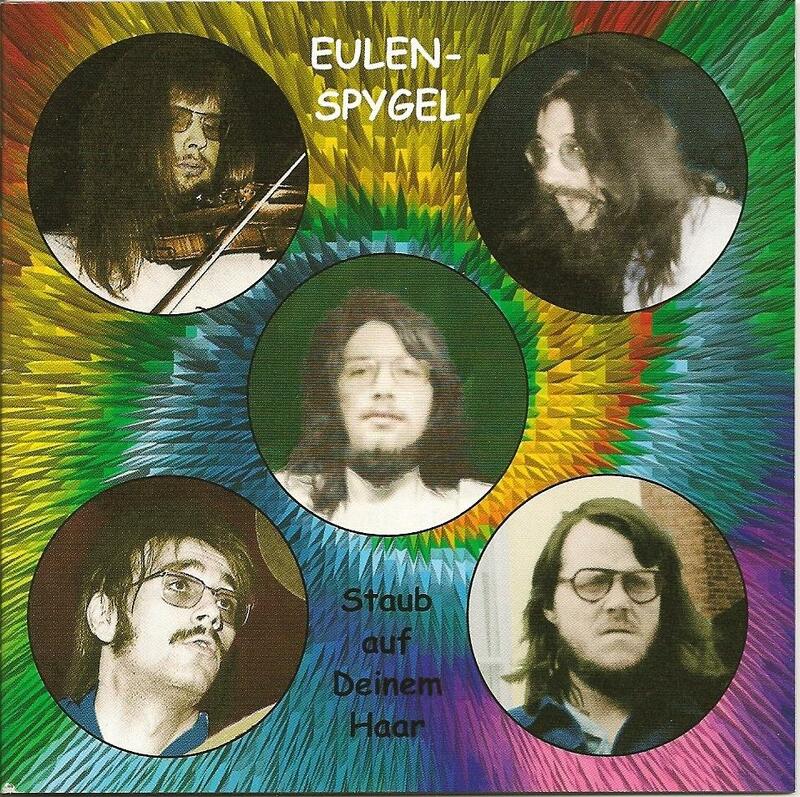 Eulenspygel were a very left wing band which caused problems with their record label and ultimately caused them to not be re-signed. UNTERTANENFABRIK horn section intro and then into the German version of David Clayton Thomas (Blood Sweat and Tears vocalist). The difference between Eulenspygel and Amon Duul II is that Amon Duul II was creating something truly unique in every aspect with no aspirations to top 40 music....Heavy riffage with sax that's ominously wicked! But then back to the goofy vocals! RING FREI (MEDLEY) goofsome intro, then off the hook instrumental, and then back to the vocal! Some nice acoustic guitar strumming!! KINDERLIED more affected male vocals, kinda like the vocals in a musical?!? Along with very reverby murky rock music...KONSUMGEWASCHE more groovy wild and crazy guy vocals along with big wall of standard fare "rock" music! Then goes jazz take five with Gunther and the boys...pretty rockin'...then some harmonica boogie woogie! TEUFELSKREIS nice uptempo rock music! I guess I just don't care for singers that sing "good," just like I don't like "good" writers! What's wrong with me? I guess too many Black Flag shows?!!?!? But I think it's really cool that Garden of Delights has re-issued this!!!!!!!!!!!! !